Who We Are - What We Do - Uptown Dallas Inc.
Uptown, Dallas continues to be the economic engine that drives Dallas forward and Uptown Dallas, Inc. is the public improvement district (PID) company that manages and enhances the public realm. The Public Improvement District (PID) is funded by special assessments paid for and voted on by property owners and in 1993, Uptown Dallas, Inc. (UDI) was established, creating Dallas’ first live-work-play community. These assessment dollars have paid for the management and enhancement of public safety and security; the design and construction of public infrastructure improvements; the maintenance of common areas, lighting, pedestrian amenities and linkages that make Uptown one of the most desirable places in all of Dallas. These improvements are the competitive advantage behind the success of Uptown which have led to the highest office rents and occupancies in the city and one of the best multi-family markets in the region. The 130-year-old neighborhood known as Uptown has seen a surge of residential growth that also brought retail, restaurant, office and hotel opportunities. Uptown is adjacent-to and north-of downtown Dallas, and is generally bordered by US 75 (Central Expressway) on the east, one block north of Blackburn Street on the northeast, Katy Trail on the northwest, Harry Hines Boulevard (and its derivatives) on the west, Spur 366 (Woodall Rodgers Freeway) on the south. Three decades ago the area was in severe decline but speculators saw potential and in the 1980’s bought and cleared land, hoping for a new wave of office development. Their hopes turned sour when the real estate market collapsed in the mid-1980s. But the weak market created favorable conditions for building new housing in Uptown. Low land prices in the area made housing development economically feasible. Seizing the opportunity, Columbus Realty Trust (now MAA) bought eight properties in the Uptown area, with plans to build apartments, lofts, and townhouses within walking distance of the area’s existing businesses on McKinney Avenue. In 1988, Columbus and others in the area formed a partnership with the City of Dallas to revitalize the area. The city created the State-Thomas Tax Increment-Financing (TIF) district, the first TIF in Dallas, which allowed a portion of tax revenues collected in the area to be dedicated to improving the district’s infrastructure. The water and sewage systems were revamped, utilities were buried, and streets were repaved. Columbus launched the Uptown building boom in 1991 with the Meridian on State Street, a 132-unit luxury apartment complex derided as folly by Dallas’ real estate community. However, the pioneer effort proved that there was pent-up demand for high-quality city living in the Dallas market. Within weeks, every unit in the Meridian was leased. Columbus built on its success and quickly opened the Worthington on McKinney. At the beginning of 1991 another large land assembly known as Cityplace was sold by Southland Corporation (now 7-11, Inc.) to a newly-formed entity called Cityplace Company. This assemblage included 65 acres between North Central Expressway and the MKT railroad track. This 65 acres now constitutes the northern portion of the Uptown Public Improvement District. Surveys had shown that one of the major impediments to residential growth in the intown Dallas area was the lack of basic service retail. The top two priorities based upon these surveys were a grocery store and a Target store. In 1992 Cityplace Company made a deal with Target to locate just across the Expressway from Uptown in a newly-created shopping center that later included Office Max, Ross Dress for Less and a Loews movie theater. At the same time Albertsons built a grocery store at the corner of Lemmon Avenue and McKinney Avenue. The Target and the Albertsons were key elements in fueling the residential boom that began in the early 1990s. In 1992 the City of Dallas created its second TIF known as the Cityplace Area TIF. Key elements of this TIF were the completion of new infrastructure including new bridges across Central Expressway at Lemmon Avenue and Blackburn Street, the creation of new streets including Blackburn, Cityplace West Boulevard, Noble Avenue and Oak Grove, the burying of all overhead utilities in the area, planted medians on Blackburn and Lemmon, and the extension of the McKinney Avenue Trolley from Hall Street to the new DART station at Central Expressway via Cityplace West Boulevard. The trolley extension also encompassed West Village, a 350,000 square foot mixed-use retail and residential center that was completed in 2000. Other developers, residents, business and land owners saw the growing popularity of Uptown and wanted to both enhance and protect the area. They approached the City of Dallas with plans for Uptown that included an organization to manage the area and a funding source to pay for improvements. Uptown, Inc. was incorporated in the State of Texas on June 24, 1992. The incorporators and first board members were: Phil Cobb, Hank Rossi, Robert Shaw, Neal Sleeper and Charles Womack. The corporation was organized to promote the resources, maintenance, upgrading of infrastructure and special services of an area known as Uptown of the City of Dallas, Texas. The corporation was recognized by the IRS as a charitable, tax exempt organization under section 501(c)(3) on June 30, 1997. 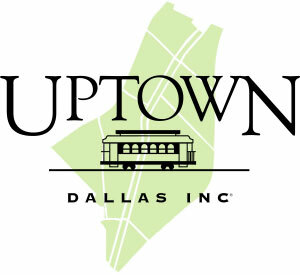 The corporation renewed its incorporation as Uptown Dallas, Inc. in 2007. On April 15, 1993, the owners of real property within the proposed Uptown Public Improvement District (the “UPID”) delivered to the City of Dallas a petition to create the UPID. The majority of property owners agreed to pay a special assessment to cover varied improvements throughout the district. The UPID has gone through renewals in 2000, 2005 and 2012. The next renewal will be on or before December 31, 2019, if not renewed through the petition and approval process, it will be terminated as provided by law. The purpose of the UPID is to enhance the maintenance of capital improvements in public right-of-ways, to plan for physical improvements, to support the McKinney Avenue Trolley operations, to construct and fund transportation improvements or programs to mitigate negative impacts of traffic, to enhance security, to provide marketing information to promote Uptown, and to provide other services and improvements. The funding of operations, approved by the City of Dallas, is paid primarily from assessments on the real property in the district. In November 1995, UPID entered into its first contract with the City of Dallas. It was an agreement that enpowered UPID to manage the district to fulfill its purpose using the assessment collected from landowners in the area services for the Corporation. This year in 2012, the City of Dallas authorized the approval of a resolution renewing the UPID for period of seven years through December 31, 2019, and extending the management contract with Uptown Dallas, Inc. as the management entity for the UPID. The Uptown Dallas, Inc Board of Directors are comprised of 70% property owners and 30% renters from the Uptown district. Property owners make up 30-40% commercial and 30-40% residential whereas renters are 20-25% commercial and 5-10% residential.